You already know the 12 Days Of Christmas, with its drummers drumming and partridges and gold rings, but we here at The A.V. Club like to take everything one step further, for your reading pleasure. Hence, 13 Days Of Christmas, a collection of essays on a handful of beloved holiday classics and a few that have sadly fallen through the cracks. Up today, It’s A Wonderful Life. Geneticist George R. Price concluded the way altruism works is like this: We carry DNA that we hold in common with our direct relatives, our less direct relatives, all human beings, all primates, all mammals, and all living things, in descending order of how much we and they have in common. That percentage in common is what drives altruism, our willingness to sacrifice ourselves for the wellbeing of others. Say you see someone trapped in a burning building. If it’s your child, you’ll run in there as quickly as possible, both because that’s what parents are conditioned to do and because that child is a direct continuation of your own genetic line. What if it’s your niece or nephew? Again, you’re very likely to risk everything to save the kid, because of the connection you have. But what if it’s some kid you don’t know? What if it’s a puppy? What if it’s a plant? The further our DNA gets from that which is threatened, the less likely we are to risk everything to save it. The unknown child perpetuates the human race; the puppy perpetuates a fellow mammalian species. But the plant? You’ll let it burn without a second thought. This thought revolutionized the understanding of psychology, genetics, and the concept of goodness. It made Price’s career. It also ruined his life. “Goodness” is one of those things we like to believe is capable of making humanity more than just a collection of animal impulses. Yet even a quail will sacrifice herself to protect her young, and when we get right down to it, we’re all systems of evolutionary checks and balances. Price, an atheist, had a conversion to a kind of radical Christianity after arriving at his theory of altruism. He started opening his home to the homeless, trying to find that one selfless act that would prove goodness wasn’t as hardwired into us as our own worst impulses. He never succeeded. On January 6, 1975 (the Feast of the Epiphany, the day that marks the traditional end of the Christmas season), Price killed himself in a London squat where he had been living. He had become depressed over the holiday and never broke through his own bleakness to resurface. Price had found a way to express kindness via math, and it became a tragedy that haunted him. 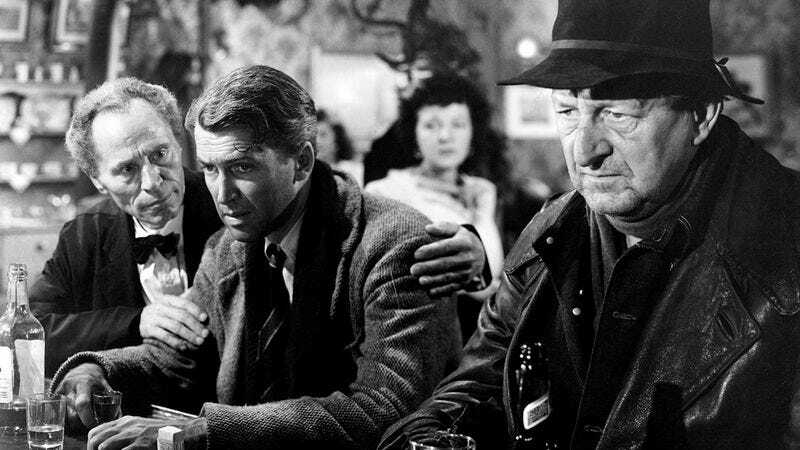 I’ve seen It’s A Wonderful Life more times than any other film, I would wager, yet it was only on this time through that I realized something monumental about it: Every time George Bailey, the film’s hero, portrayed by Stewart, gets a chance to escape to the life he really wants, somebody tells him he should. And then he ultimately decides that, hey, maybe he should keep living in Bedford Falls, fighting the fight of building that normal life for the hundreds who won’t have it otherwise. When he sticks around the little town to tidy up his dead father’s affairs, he’s told, repeatedly, to just get out of town before he’s any later for school. Instead, he gives up his spot to his brother and takes up his father’s quixotic cause of battling rich curmudgeon Mr. Potter. When the Depression nearly wipes out his business, the Bailey Building & Loan, he’s asked by his newlywed wife, the otherwise saintly Mary, not to see what the run on his business is before leaving for their honeymoon. George is given outs, perfectly reasonable outs, every time he makes a choice, but every time he chooses to stay, to become further enmeshed in his own happy little hell. At this point, seemingly everybody who’s written about Wonderful Life in the period after its resurgence in the ’70s (when it fell into the public domain and started popping up every Christmas on dozens of channels) has noted that the film is far darker than its reputation. Where most other classic Christmas films are steeped in warmth and nostalgia—see also: A Christmas Story—Wonderful Life is steeped in melancholy for a world that was and an uncertainty about what life had become. It’s the reverse of Dickens’ Christmas Carol, wherein a good-hearted, middle-class man is warped and frustrated by his inability to live any of his dreams. The movie’s closest thing to a Scrooge figure—Potter—wins out time and again, cackling gleefully about his dominance of the town’s economic affairs, and every victory George wins is simply a victory to keep existing. He, too, has a Christmas epiphany, but it’s not one that convinces him the best thing in life is to live unselfishly. He’s already seen where that got him. No, he realizes the best thing in life is simply to live. One of the things that makes Wonderful Life endure is just how cracked it is. Yes, we get the little angel framing story that lets us know we’re not just watching a slight and unlikely morality tale, but for the most part, the film is a relentlessly small-scale tragedy of errors. George makes a decision for anyone but himself. He is beaten down by it. Everybody else, whom he sacrificed for, gets ahead. Rinse. Repeat. It’s like George Price’s nightmares come to life, and it goes on for three quarters of the film’s running time. The gimmick everybody remembers about the film—wherein Clarence Odbody, the guardian angel, plummets down from heaven to show George what life would have been like if he’d never been born—only takes up roughly 20 minutes of its running time, but it’s intensely cathartic, as is the joyful ending that follows. Capra knew that the only way to earn an ending this happy would be to send the audience through utter, bleak horror, so everything before George gets to live again is shot to maximize the sense of his confinement, before breaking loose into rapture. It’s the story arc the country itself had just lived through for the four years prior. Here’s the thing: I have no doubt everybody involved with the film actually believes that George’s existence is pivotal to all of the above, that he and Mary were such super soulmates that there was no way either would have married without the other. But it also primarily exists to show us Price’s theory at work. Where Price believed that altruism gives us that momentary high we get from doing good because it benefits us on a genetic level, George gets a vivid, over-the-top illustration of same. Look at all of these people you let get ahead of you, George! Without you, they’d have fallen back behind, into squalor and decay and depravity. Without you as a beacon, the whole town would have a different name and would be such a rejection of bedrock New Deal values that it would become a thriving bastion of unchecked sin and commerce. Yet without George, Mary simply becomes a lifeless husk, doomed to a life of spinsterhood down at the library? It’s a nice sentiment about Old Hollywood’s belief in true love, but it’s also sort of silly. Even if Mary Hatch wouldn’t have gotten married without George Bailey around to love her, I have to believe she would have found something she loved to occupy her time. Granted, we get maybe a minute of screen time with her, and it’s mostly there to prop up George’s own need to believe he’s touched everybody for the better. But it still stings, just a little. Like everything else in Pottersville, the fate of Mary is meant to be hideous, grotesque. The film stops just short of saying Hitler would have won the war if George hadn’t existed; it’s that unsubtle. In some ways, though, that lack of subtlety is needed. It’s what gives the famous ending its punch. Price lost a lifetime in pursuit of perfect altruism, of that moment when someone would do something so selfless that it would prove to him some sort of transcendence inherent in the human soul. But he knew too much. He’d found the equation, and he understood that all things are accounted for in the genetic code. Yet even if Price found the cause of our altruism, the results of it are rarely that obvious. Give a panhandler a dollar, and you can never know just what that dollar is used for. Save the unknown child in the burning building, and you don’t know if she’ll grow up to greatness or to shrug off that gift. Similarly, the United States in 1946 found itself facing questions of what its ultimate victory over fascism would mean for the future. Like George Bailey, the country had lived through the carefree youth-filled years of the ’20s, only to throw all of that off for the hard-earned responsibility of the ’30s and ’40s. It’s easy to look back now and say that defeating fascism was worth it, but in 1946, the question of whether the anguish and pain of World War II was all worth it was still very much open. Being a good person has to be the reward in and of itself. Doing the right thing has to be the reward in and of itself. It doesn’t matter that we know the brief feelings of happiness we get from dropping that dollar in that cup are driven by Price’s algorithms, so long as we also know that the things we do could make the world a better place. The news this December is terrible, full of unrelenting stories of death and horror, so grim we find every silver lining, every tiding of comfort and joy. Does it matter where our better angels come from, if they give us the strength to stand up to tyrants or madmen? George Bailey gets that demonstrated to him first in a dark fantasy, a dream that’s not a dream. But then he gets it reflected back at him in reality, only tenfold, by friends he’s made and kept over the years just by being decent, by ignoring the outs others gave him and doing the hard work necessary of being a good man. Maybe there are no angels, and maybe it’s all self-flattery, a reverie designed to trick himself back home to face the music. But the money that pours in is real, and the friends who love him are, too. The money won’t last. It’ll cover the debt, and the Baileys will go right back to being broke. At best, George will just stay out of jail. The memory of his reverie will fade in time, as all memories must, eroded by the passage of life itself. There will always be Mr. Potter, there to take advantage of every moment of goodness and perceive it as a weakness, just as George Bailey will always stare out the window at the snow-capped roofs of Bedford Falls and wonder what’s out there beyond the world he can see. He’ll never fix the banister, and the house will always be drafty, and Mary will always love him. He will be good, because he must be good. And maybe that will be enough.